Cream the butter and sugar together. Mix in the egg. In another bowl, combine the dry ingredients: flour, cornstarch, salt, baking powder, and baking soda. Pour half of the dry mix into your butter/sugar/egg mixture and combine. Mix in the milk and then add in the remaining half of the dry ingredients. 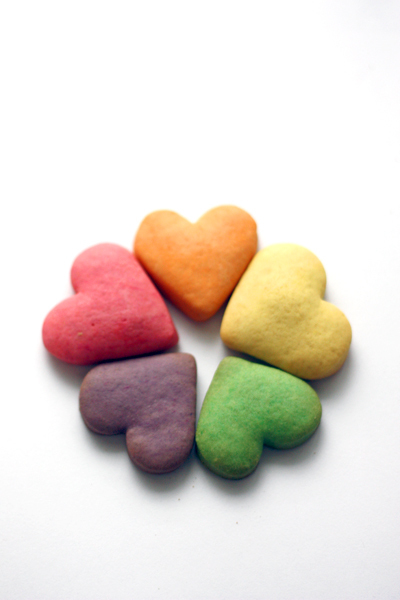 For colored hearts, divide the dough into five equal pieces. Take one piece of dough, add two drops of food coloring, and knead the dye into the dough. Repeat with the other dough pieces with different food colorings. 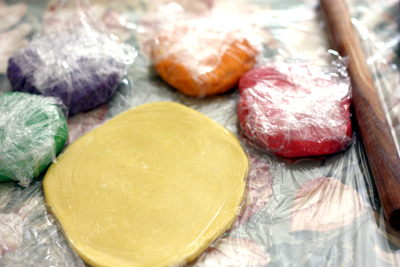 Wrap each piece of dough in plastic wrap and chill them for 1 hour. Preheat the oven to 325ºF. Take the dough out of the fridge. Sandwich one piece of dough between two pieces of plastic wrap on a flat surface (or place on a flat, floured surface). Roll the dough out to 1/8 inch thick and cut with a cookie cutter. 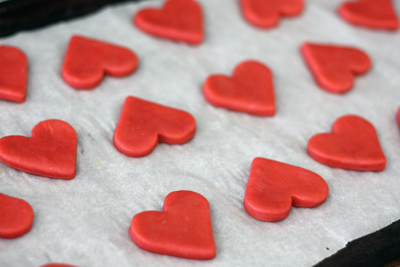 Place cut-outs on parchment lined cookie sheets. Repeat with the other doughs. Bake each sheet for 15 minutes. Then cover each sheet with a piece of aluminum foil (to preserve the colors) and bake for 10 more minutes. Let cool on tray. If the cookies still aren't crunchy after cooled, place back in the oven, still covered by the foil, and bake for 5-10 more minutes and then let cool again. Feel free to skip the 2nd baking step if you'd prefer softer cookies. Makes approximately 50 large cookies or 75 small cookies. These are so cute! I love the colors. Some ppl freak about the food coloring. It's fun ppl! (I did a rainbow cake, which got hated reviews on other sites, but not mine). What wonderful photos - great job! These are so pretty and cute! Great photos, too. Just discovered your site--everything you make is so adorable! These are so adorable! :) I have a lot of food coloring left over so this is the perfect project to do. Thanks for sharing! La Table De Nana: I like to think that the rainbow colors bring a new level of appeal/cuteness to the cookie. Rachelle: Thanks! Yeah, I know many people who spaz over colored foods. I try to use more natural methods to color food like matcha powder or crushed dehydrated fruits or even jam when possible, but that's not that often, sadly. I remember seeing rainbow cakes on a couple of blogs a while back and I thought they were quite cool! h.tea: I hope you do! They're quite yummy, especially with a cup of tea. S: Welcome to the site and thank you! ZarpandiT: Thanks for the sweet comment! I'm so glad to know you enjoy my blog! Tammy: Hehe, definitely the best way to use up food coloring: bake colorful treats! this is perfection! your creations have everything going for them--the shape, the hues, the fact that they're COOKIES and therefore DELICIOUS. very nicely done! I stopped by to invite you to check out our new food photo submission site at dessertstalking.com. Hope that you will stop by and give us a try. grace: Thanks! And yes! Cookies, key factor, haha. donalyn: Thanks for sharing. I'll definitely check it out. Sounds delicious, a site just for desserts. Megan: Thank you for the comment! A thing about adding dye to traditional shortbread is that it should probably be added in initially with the wet ingredients so that the dough doesn't get overworked. But, luckily there weren't any negative effects of my adding the dye in later, since this isn't a shortbread recipe that should turn out sandy/crumbly :). Tammy: Did you chill the dough before cutting it out? For me, the dough was quite sticky right after I made it, but after I put it in the refrigerator for an hour, it was much easier to handle. Then, as I was rolling it out, if the dough became too soft, I put it back in the fridge to chill for a while. Hopefully that helps! Thanks for your reply! :) Yeah, I let it chill for an hour or so. I'll try again soon and let it chill for a little bit longer than that, I guess. i saw these and fell in love! Tammy: No problem. Hopefully it goes well. If you still have problems with stickiness, just add a bit more flour. Carly: Thanks! I love rainbow colored food too! Seeing rainbow colored desserts automatically cheers me up, hehe. Dorothy: Thanks! It's a pain to have too many cookie cutters that I'll only use once a year, so I try to make my cookies from simple shapes like circles and rectangles along with shapes that can be made with everyday items like straws. I'm glad you like it :D! Anonymous: Yay, I hope it helps when you try making them again. love these!!!! I've been googling rainbow food tonite and your site came up...must try these! 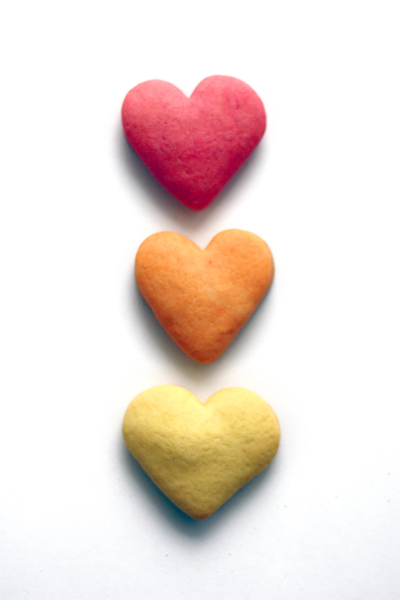 michelle: Haha, I <3 rainbow foods; they're quite pretty and eye-catching. Definitely try these out. hi! i love reading your blog, you are so creative! have you ever made this using full-fat milk? do you think it will be too sweet if i used that? cella: I've never tried using full fat milk, but I'm sure that you can use that instead of non fat milk. It should pretty much taste the same. Dilek: Thanks! Do try them out :). how much is approximately one stick of butter? Would love to know how much a stick of butter is too! mine won't hold it's colour.. and i used tinfoil! Samantha: What do you mean it won't hold it's color? Like after you bake it it's no longer colorful O_o? Perhaps you need to add more food coloring to the dough, or use stronger food coloring like gel food coloring. Found you and your penguins on tastespotting! Can't wait to see what you do next! I can't get my done cookies to look smooth too. If I put them in with creases on top, they come out with creases on top. What should the texture of the dough be like before being chilled in the fridge..? 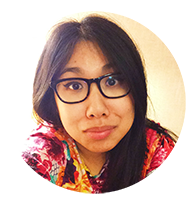 Kathleen: Welcome to the blog! Allie: I remember the dough being sort of sticky before chilling. Are you adding a lot of food coloring? If you are then there's probably too much liquid. But even if you aren't if the dough is way too sticky, I think you can add a bit more flour to the dough before chilling. Typically if the dough goes into the oven creased, the cookies will come out of the oven creased. I found that rolling the dough out between plastic wrap helped keep the dough smooth. 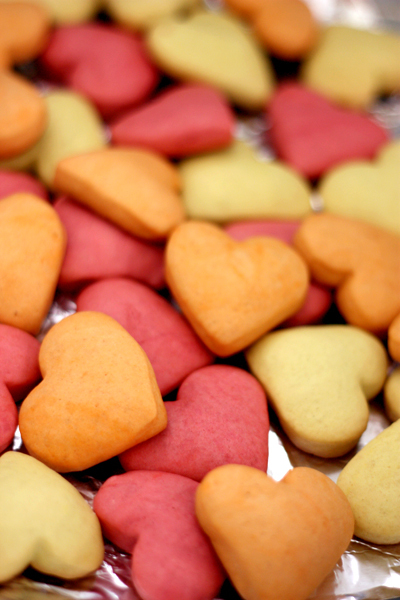 Hi, i think that these cookies are super cute and I love the size of yours! I was just wondering, where did you get your heart shaped cookie cutter? Zuckerbäckerin: Thank you for sharing! I love how you made them into flowers. They're adorable. I have one problems with them, the dough only sticks to my fingers! Anonymous: Yes, I do, haha. I use gel food coloring rather than liquid coloring because then I can use less of it because the gel is much more concentrated. That sounds awesome, the tetris piece ides. Mari: Yeah, that's a problem with this dough. Chilling it makes a big difference because the butter becomes more solid and the dough gets firmer. But, you can always dust your surface with extra flour if necessary to prevent sticking. These are adorable!!! My kids would go bonkers over them and what a fun treat to take to preschool! Quick question on the size of your cookie cutter... is it a teeny tiny one, or a more typical small-sized one? The baking times make me a bit nervous to make little bitty cookies, but they'd sure be cute! THANKS!! These are normal sized cookies 2-3 inches wide. These are so sweet! 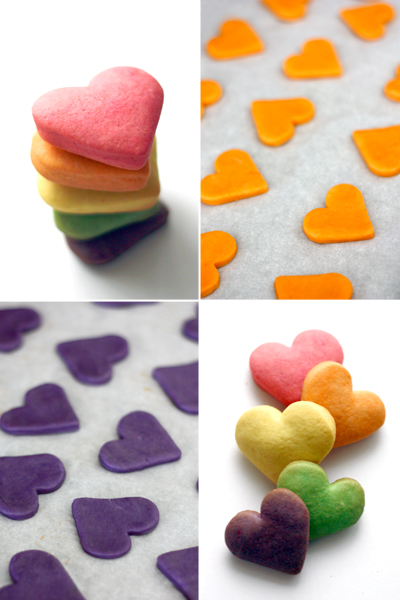 Not just for Valentine's Day, but any sort of rainbow day!! Thanks for sharing! I made these yesterday. Like another poster stated, I too had issues with stickyness. The dough stuck to my linzer-cutter, but not so badly to regular cutters. They turned out pretty cute, but not as cute as yours of course! I found them to be VERY hard so I cut out the 2nd baking step, as you stated to do. They were still hard, but a little soft in the middle which is more what I was going for. Great recipe! I stuck to a heart cutter since it's relatively simple without any ridges so the dough wouldn't stick as much. It definitely helps to flour your cookie cutter very often so the dough sticks less. I preferred crunchier cookies to soft cookies, but it's all based on personal preference. Glad to hear you got what you were aiming for. What a great idea! Think I'm going to have to make some of these for everyone at work for Valentine's day! Hi! Just tried these. They taste fabulous but I can't get your vivid colors with just two drops. I used gel colors, do you think I could add A LOT more drops and should I add it while using the mixer rather than using my hands for a more overall look? Thanks! I would stick with adding it by hand to prevent over mixing your dough. But if your colors aren't as vivid, add a bit more food coloring (maybe we're using different brands of food coloring which would account for the difference in saturation. Really there is a 1/2 cup of cornstarch? Seems like alot. Yup there is. This is a recipe from a book for lighter desserts so the cookies contain less fat. The cornstarch acts to make the cookies more tender which is necessary in this recipe to help with the lack of fat. It makes the flour more like cake flour, lighter in texture. The were great and cute! Shouldn't there be vanilla in the dough? LOVE these little cookies! Question....Can I cut back on the corn starch and use 2% milk?